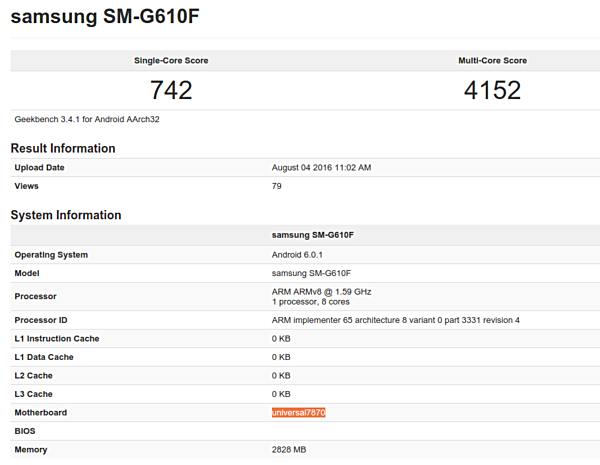 Over a month after a GFXBench listing revealed Snapdragon-powered Samsung Galaxy On7 (2016), an Exynos variant of the upcoming device has been spotted on another benchmarking website Geekbench. The Geekbench listing reveals Exynos 7870 chipset, 3GB RAM, and Android Marshmallow version 6.0.1. The device carries a model of number of SM-G610F, which is said to be for the Indian market. The Snapdragon model, on the other hand, may only be launched in the Chinese market, reports say. The SM-G610F was also recently spotted in a listing on Zauba, suggesting that the phone will feature a fingerprint sensor as well.